Manx Basking Shark Watch | GREAT NEWS: MAE’S TAG IS RETRIEVED AND MAE THE BASKING SHARK IS PROBABLY FINE! GREAT NEWS: MAE’S TAG IS RETRIEVED AND MAE THE BASKING SHARK IS PROBABLY FINE! Excellent news! Mae the 7.5m long female basking shark is very probably OK. The story unfolded in front of me last night after quite a lot of detective work that involved me bothering quite a lot of people! Particular thanks to Emmett! 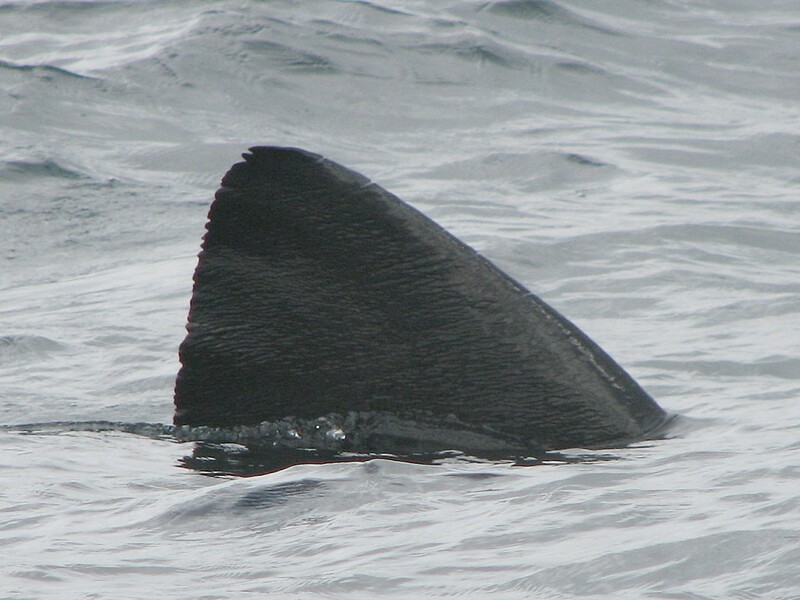 This fin photo is NOT of Mae’s fin but it shows a large healthy basking shark (number 21 in the basking shark fin catalogue) who’s dorsal fin shows evidence of having being temporarily caught in a net. It turns out that at about lunchtime on the 17th November 2017, Mae was swimming at about 100m depth in the Celtic Deep when she was accidentally caught in the nets of an Irish boat that was fishing for whiting and haddock. The net broke at depth and Mae’s very expensive SPOT satellite tag was found trapped in the net. The fisherman who very kindly returned it to me spotted that it belonged to Manx Basking Shark Watch and that there was a £50 reward for it’s safe return. I had a long chat to the fisherman, who prefers not to be named. I am very grateful that he took the time to contact us to return the tag and that he was willing to chat about his experience of basking sharks being accidentally by-caught in that area. He told me that small basking sharks tend to go out of the end of the net without breaking it but they still put slime all over the net whereas big basking sharks tend to break the net at depth and are rarely brought to the surface. This makes perfect sense to me as I have photographs of many basking sharks that are hale and hearty but they have obvious net marks on the leading edge of their dorsal fins. 1: The net breaks and has to be mended. 2: The rest of the catch for that net shoot is lost when the net breaks. 3: The net is covered in the thick, smelly black slime that covers these huge fish (the same slime that we get the DNA for our scientific studies from) and the net has to be dried for nearly a whole day before it can be used again. If they use the same net again before they have dried it the slime attracts another basking shark into the net! They obviously don’t want that to happen. 4: It is illegal to land basking sharks so they are at risk of being prosecuted even though it has happened by accident. When you read the list of problems associated with accidentally catching a basking shark in a trawl net you can understand that fisherman would dearly love to avoid catching them! I went to a conference recently where scientists described the various methods they are testing to help fishermen avoid catching sharks in their nets. The satellite-tagging of basking sharks is also revealing where the important over-wintering sites for basking shark are. We hope that this will eventually help the fishermen avoid these areas. The satellite tagging work is being done by various scientific groups, most notably Dr Matt Witt’s group at Exeter University, Emmett Johnston who is doing a PhD on basking sharks in Ireland, a French group called APECS and ourselves (Manx Basking Shark Watch). Having ‘bothered’ a lot of people trying to track down the tag and hopefully hear the story (as I did) I then discovered that the fisherman had emailed me 2 days previously and it had gone into my junk mail! Many, many thanks to everyone who helped me most especially to Emmett Johnson, a fellow basking shark scientist who works in the area that the tag was transmitting from. He leapt into action and, I believe, knocked on a few doors before he found the correct fisherman in the correct house. I am sure that Emmett was a little perplexed and more than a little vexed to return to the fisherman’s house with the £50 reward to find the fisherman talking to me on the phone! I had, of course, just found the fisherman’s message and phone number in my junk box!